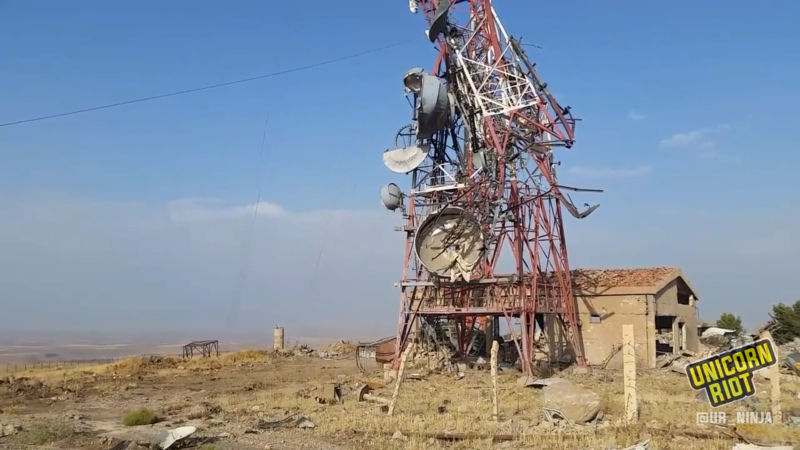 Democratic Federation of Northern Syria (Rojava Cantons) – A Unicorn Riot contributor reports from Syria the quiet aftermath scene of an April 2017 attack by Turkish armed forces on a media center and military base operated by the YPG (People’s Protection Units, KU: Yekîneyên Parastina Gel, AR: ‏وحدات حماية الشعب‎‎) and YPJ (Women’s Protection Units, KU Yekîneyên Parastina Jin, AR: وحدات حماية المرأة). 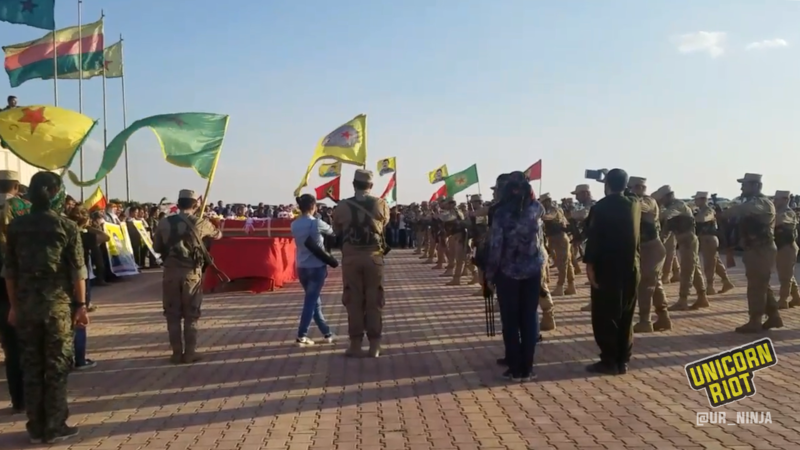 The YPG and YPJ are the largest military formations within the Syrian Democratic Forces (SDF), a coalition of armed popular militias defending the Democratic Federation of Northern Syria. They are aligned with Syria’s Democratic Union Party or PYD (KU: Partiya Yekîtiya Demokrat‎, AR: حزب الاتحاد الديمقراطي). Within the six and a half years of Syria’s churning uprising-turned-civil-war, domestic and international parties have formed ad-hoc alliances and sets of proxy relationships with smaller armed groups, sometimes shifting between armed conflict and tense mutual arrangements. It’s a complicated arena (as seen on the complicated color-coded map below); in this article we’ll focus on northern Syria and the factors that gave rise to the modern Turkish-Kurdish side of the Syrian conflict. In 2016, the YPG/YPJ, with support from the United States, led the SDF’s Manbij offensive west of the Euphrates River. This successful offensive cleared the Islamic State of the Levant’s (ISIL) grip from north-central Syria and gave the SDF control of a long stretch of the Turkish border, uniting the Kobane and Cizire cantons. 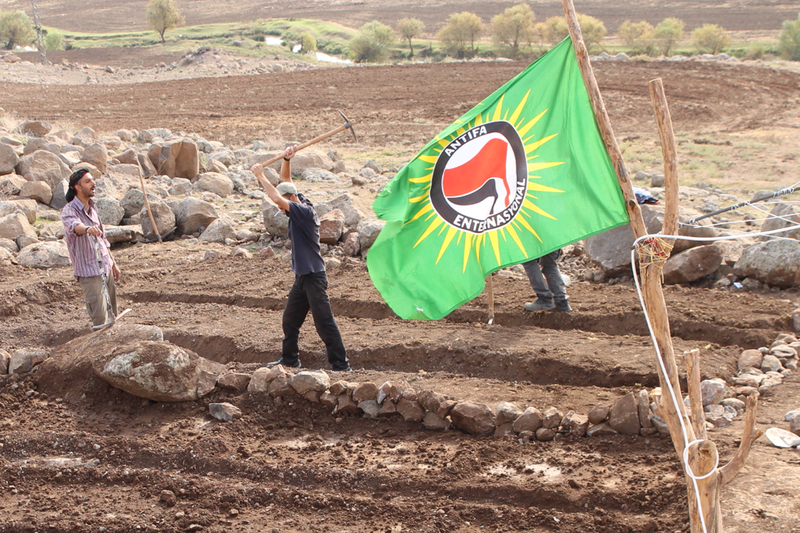 From the Rojava, or the Democratic Federation of Northern Syria, perspective, after the Manbij campaign in this area of Syria, the PYD is the overall political power broker, while the overall federation set up here is an amalgamation of many ethnically diverse and autonomously self-organized councils, or cantons. On August 24, 2016, in response to ISIL capturing territory on its border, as well as the SDF offensive spearheaded by YPG and YPJ units, the Republic of Turkey’s (TR: Türkiye Cumhuriyeti) president, Recep Tayyip Erdoğan, launched a military intervention into Syria code named Operation Euphrates Shield (TR: Fırat Kalkanı Harekâtı). The 2016 Euphrates Shield campaign featured Turkish-backed armed groups and elements of the Free Syrian Army (FSA), such as the Sultan Murad Division, that fought both ISIL and YPG affiliated units, mainly in Syria’s Aleppo governorate, as well as challenging Kurdish control of the town of Manbij. Turkish tanks, artillery and air units succeeded in preventing the SDF from pushing west from Manbij and east from Afrin. During this campaign, on November 29, 2016, Michael Israel, an American YPG volunteer from California, was killed by a Turkish airstrike. With Operation Euphrates Shield, Turkey and its allies displaced ISIL and expanded a zone of control towards Aleppo, which currently includes the strategically critical towns of A`zaz, al-Bab, and Jarabulus, where the Euphrates River crosses the Turkish/Syrian border. In the two years prior to the SDF Manbij offensive and Euphrates Shield, Turkey generally tolerated ISIL activity along its southern borders with minimal military pushback. This was a consistent policy motivated by the goals of increasing pressure against Bashar al-Assad’s national government based in Damascus, as well as the emerging Kurdish-dominated cantons of northern Syria. Turkey, at times facilitated, and otherwise passively permitted primarily Sunni militants to filter into armed groups fighting Damascus and controlling parts of Syria, including al-Qaeda linked groups like the Nusra Front (Jabhat-al Nusra) and ISIL. As ISIL solidified control throughout the region, towns like Manbij and al-Bab served as critical ISIL supply nodes. In 2017, Turkey’s Foreign Ministry released a report (PDF) announcing its strategy to wear down ISIL and finally break up its networks inside Turkey. The report attributes 14 major terror attacks inside Turkey to ISIL; including 10 suicide bombings, which killed 304 people and injured 1,338. The most serious attack was the bombing of a large peace rally at the Ankara train station on Oct. 10 2015 which killed 102 people. Turkey has tried to label both PYD/YPG and ISIL as terrorist groups threatening its security. Both PKK and PYD/YPG see Öcalan as their political leader. The United States and Turkey both assert PKK is a terrorist organization, and Turkey claims that PYD/YPG are the same organization as PKK and attempting to split up Turkey, while PYD/YPG asserts they are not the same as PKK and are aiming for federalization of the region they control in Syria. At various times since 2000, the Turkish government pursued a peace process with the PKK, although this deteriorated as the Syrian Civil War increased in intensity. During some elections, Erdoğan’s political party, AKP (TR: Adalet ve Kalkınma Partisi), attracted significant Kurdish support because it was more Islamist and potentially more sympathetic to Kurdish interests than the secularist Kemalist party, CHP (TR: Cumhuriyet Halk Partisi), that historically backed the suppression of Kurds. Across southeastern Turkey, HDP (TR: Halkların Demokratik Partisi), was locally elected at a euphoric moment in 2015. The summer of 2015 was a complex and violent one: ISIL gained a tighter grip in northern Syria, alongside fighting between Kurdish and anti-government rebels, and military activity on both sides of the Turkish border kept increasing as Turkey openly moved militarily against PKK and sought to shore up opponents of Kurdish militias in Syria. On July 25, 2015, the PKK canceled the ceasefire Öcalan had declared in 2013, citing Turkish airstrikes on PKK sites in Iraq. Political observers noted in late 2015 that many Kurdish voters rejected AKP in Turkish parliamentary elections, as nationalist rhetoric increased during the battle for the Kurdish town of Kobane in Syria. Pursuing what it saw as an overwhelming military campaign against the PKK and its supporters, the Turkish military dealt harshly with many urban areas of southeastern Turkey, seriously damaging neighborhoods, including the old city of Diyarbakir, a provincial capital on the banks of the Tigris River that is considered a center for Kurdish politics in modern Turkey. In May 2016, the NGO Mazlumder reported (PDF) in the town of Cizre more than 10,000 homes were destroyed and at least 200 people were killed during military operations and curfews. In September 2016, civil relations reached a new low as Ankara removed elected mayors in 24 primarily Kurdish towns, which had been governed by elected HDP officials. On April 11th, 2017, the PKK claimed credit for bombing a police station and killing three in Diyarbakir. The Turkish government cited this PKK attack as their pretext for their deadly bombing of Qereçox Mountain at midnight on April 25th (see video below for scenes from the bombing on Qereçox Mountain). 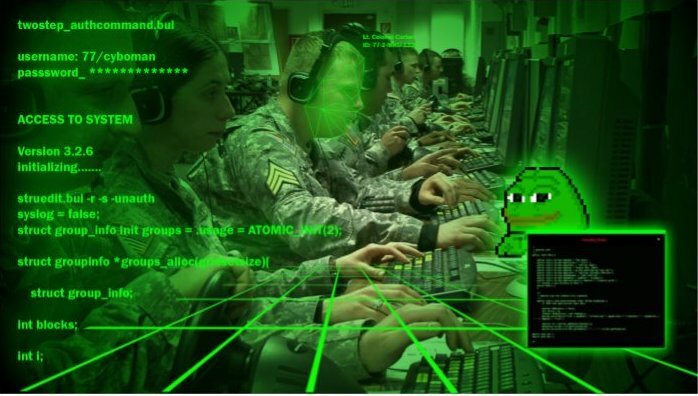 In recent years, the United States has provided direct military assistance, including airstrikes and intelligence to YPG, despite its position that their ideologically related counterparts across the Turkish border are a terrorist organization. Journalists have often documented American special forces in Rojava traveling in Humvees amid YPG/SDF campaigns. While Afrin and the areas around Manbij and Kobane are predominantly Kurdish, the area between Afrin district, Aleppo, Jarabulus and the Turkish border is populated by groups like Sunni Arabs, Turkmen, Circassians, Shia Imamis, and Arabic-speaking Levantine Christians of different denominations. Excerpt of detailed ethnic map of Syria. Idlib, Aleppo and Raqqa governorates have seen a great deal of warfare in recent years. The area between Afrin district, Aleppo and Jarabulus is a mixture of ethnic and religious groups. Dark green: Kurds. Sunni Arabs: Yellow. Gray-purple: Turkmen. Christian Levantines: Red. Bright green: Imamis/J’Afaris. Circassians: Light Purple. Druze: Dark Purple. Source: Dr M Izady at Gulf2000.Columbia.edu. Used with permission. 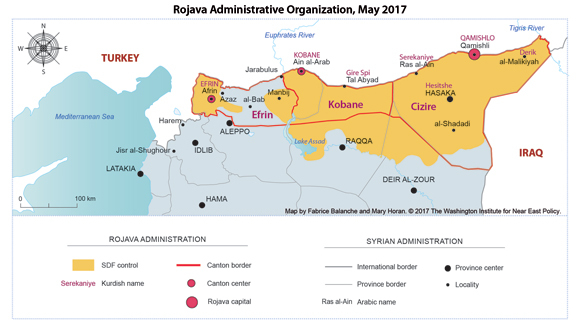 Map of the Rojava Cantons (red lines) and Syrian administrative divisions (gray lines) from May 2017, as defined by the semi-autonomous Kurdish communities and Syrian government respectively. This effectively separates Kurdish-held Afrin from the rebel-held sections of Idlib to its south. However, from the perspective of observers on the Rojava side, Turkey’s goal is to separate Afrin from Aleppo: There is a trade corridor important for economic recovery in Afrin and internally displaced families have taken refuge there; Turkey’s position does not to create a buffer between HTS in Idlib and SDF in Afrin — nor are the Turkish forces positioned to protect much of Idlib from yet another Russian bombing campaign or advances by the Syrian Arab Army. Reuters also reported some locals in rebel-held areas west of Aleppo city (an area including Turkmen and Levantine Christians), welcome the presence of Turkish military units, since that would deter attacks by the Syrian Arab Air Force (SAAF) and the Russian Air Force (RAF), which have bombed many towns in Aleppo, Idlib, Raqqa and Deir ez-Zor governorates in recent years, with thousands of civilians killed and injured. According to Reuters, an SDF representative indicated that Turkey’s intelligence units coordinated with Sunni religious militant group HTS (Organization for the Liberation of the Levant, AR: Hayʼat Tahrir al-Sham, هيئة تحرير الشام) to ensure a smooth roll-out into Idlib province. Although it is not widely reported in the United States, the governments of Turkey, the Islamic Republic of Iran (Jomhuri-ye Eslāmi-ye Irān, Persian: جمهوری اسلامی ایران), the Syrian Arab Republic (SAR, al-Jumhūrīyah al-ʻArabīyah as-Sūrīyah, AR: الجمهورية العربية السورية), and the Russian Federation (Rossiyskaya Federatsiya, RU: Российская Федерация) have moved ahead with the “Astana” process, hosted by Kazakhstan’s government. This process led to several ceasefires and areas of de-escalation, with the engagement of units from larger external governments, in many parts of Syria by the end of Summer 2017, often under tacit, rather than formally, published understandings with local parties. The Idlib ceasefire zone (also covering parts of Latakia, Aleppo and Hama governorates) was agreed upon on September 14th, 2017. Looking farther east, in recent months, the YPG, YPJ units under the leadership of SDF, have expanded their control across Raqqa and Deir ez-Zor governorates in a dramatic advance against ISIL forces that once looked poised to dominate the region. 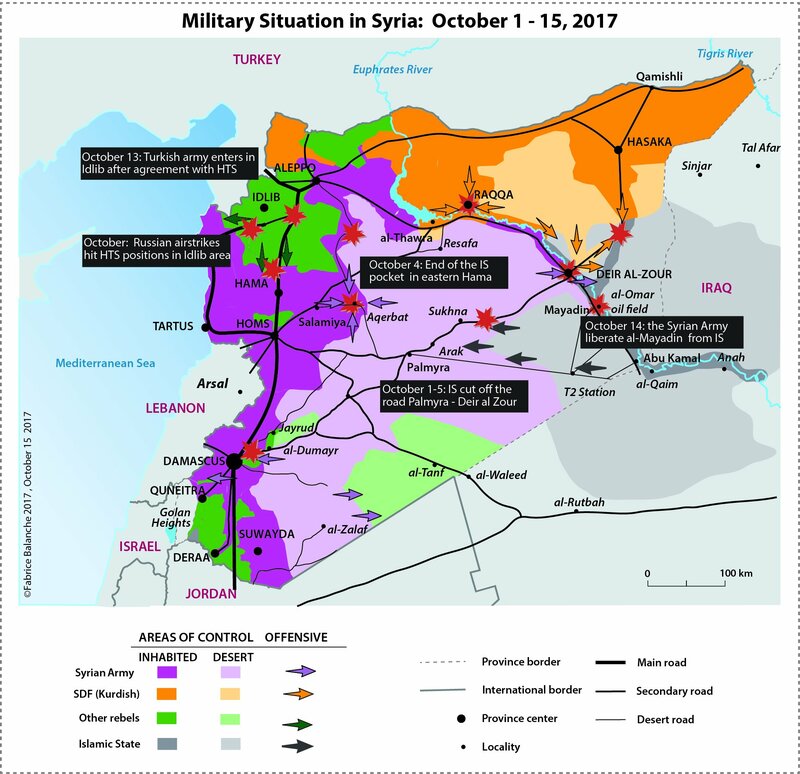 The following map illustrates the overall balance of power among these groups nationwide and some of the military actions that took place between October 1 and October 15, 2017. Six months after 24 people were killed in their sleep as the chief of the Turkish army led a bombing operation 20km into northeastern Syria against the Kurdish YPG and YPJ military facility and media headquarters on Qereçox Mountain, a Unicorn Riot contributor brings you this video update from the Democratic Federation of Northern Syria, illustrating the Kurdish perspective on this attack and provides updates from the region. Watch the video from our contributor at the top of the post. 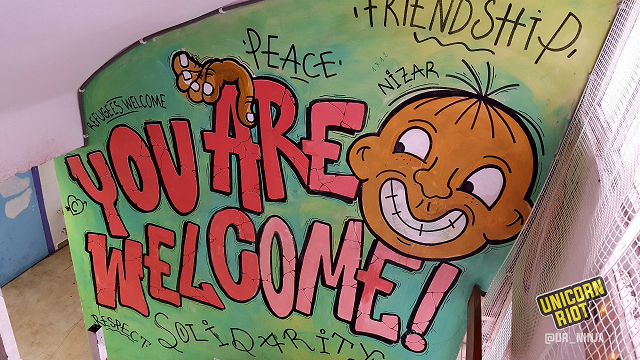 For a new analysis about the history of leftism in Turkey and the role of Kurdish organizers, the fallout from the 1980 military coup, and 2016’s violent coup attempt, see Cengiz Gunes in New Left Review on Turkey’s New Left. In the same issue of New Left Review, another article by Gunes covers how President Erdoğan has repressed the People’s Democratic Party (HDP). HDP is a primarily Kurdish-backed leftist political party that garnered 13% in the 2015 parliamentary elections and is now holding 54/550 seats in Turkey’s Grand National Assembly. Stay tuned for more contributor reporting on Syria in the coming months. 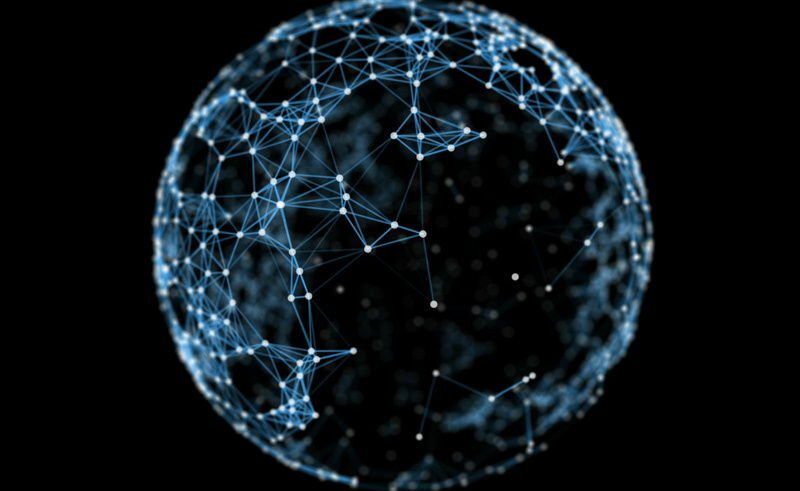 Blockchain: Revolution or Business as Usual?